Windows Live Messenger (WLM), formerly known as MSN Messenger, has released the beta version of upcoming Windows Live Messenger 8.5. The new version of WL Messenger now requires Windows XP Service Pack 2 (SP2) or Windows Vista to run. 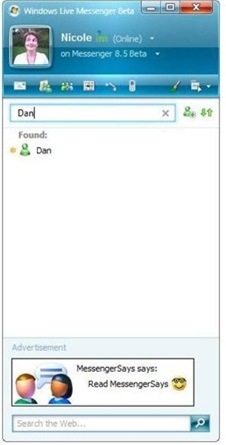 Among the new features or enhancements in the MSN Messenger 8.5 are in the following list. New Messenger Setup procedure using Windows Live installer. Windows Live Messenger shortcut in Start Menu now is placed inside a Windows Live folder, together with other Windows Live clients. New update to WLM will be automatically published via Microsoft Update. Update to graphical user interface (GUI) – now closer to Vista looks and feels. New emoticon – the bunny. Realignment of some components such as typing indicator and “Last message received..” information, and menu items. Download Windows Live Messenger 8.5 Beta 1 from http://g.live.com/1rebeta/WLMsgr85_en-us (English version only) (no longer available). If you’re from outside of supported countries such as United States, United Kingdom, India, France, Japan, Germany, China and Spain, you can visit Messenger Beta page (no longer valid) to download your copy. Other users don’t even bother to visit it, as you most likely will be redirected to download WLM 8.1 final version. Use the first link to get the English version instead.